As we recall year by year the mysteries by which, through the restoration of its original dignity, human nature has received the hope of rising again, we earnestly beseech your mercy, Lord, that what we celebrate in faith we may possess in unending love. Through our Lord Jesus Christ, your Son, who lives and reigns with you in the unity of the Holy Spirit, one God, for ever and ever. Historically today is the feast of Saint Juliana of Cornillon, also known as Juliana of Liege, who was a medieval Norbertine canoness regular and mystic in what is now Belgium. She has long been recognized as the promoter of the Feast of Corpus Christi. 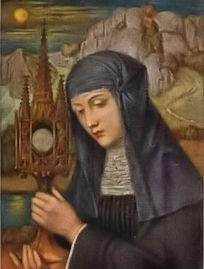 St. Juliana is little known but the Church is deeply indebted to her, not only because of the holiness of her life but also because, with her great fervour, she contributed to the institution of one of the most important solemn Liturgies of the year: Corpus Christi. Today's Station is at St. Nicholas in Prison, dedicated to the popular St. Nicholas of Myra, whose feast is December 6. It was constructed in the ruins of two temples and the ancient Forum Olitorium, and you can see fragments from the ruins reused in the church. The most important of the temples was the Temple of Piety, built by Acilius Glabrius, consul in 191 B.C. The dedication to St. Nicholas was made by the Greek population in the area.